Eternal Haunted Summer: If you could correct one misconception about ancient Canaanite religion, what would it be? What about modern Canaanite spirituality? Tess Dawson: The largest problem is more a matter of a lack of knowledge. Not too many people know anything about the Canaanites. I mention the name and I usually encounter glazed looks and sheepish confessions of people having slept through history class. Of the other Canaanite daughter culture — the Israelites — many people think they already know everything about them because the Israelites spawned biblical monotheism. Biblical studies have eclipsed Canaanite cultural studies: most often, people study the Canaanites with a goal of understanding biblical life instead of studying the Canaanites for the sake of understanding Canaanite culture. The idea of studying one culture for the sole purpose of understanding another one is backwards, and doesn’t happen with other cultural studies. The polytheistic Canaanites are the forgotten ancestors to both the monotheistic Israelites and the polytheist Phoenicians. EHS: What is the most frustrating gap you have encountered in the surviving lore? TD: To understand the deities’ stories, I rely on the literature — primary documents — the Canaanites of the city of Ugarit wrote around 1360-1200 BCE in cuneiform on clay tablets. Archaeologists have uncovered around two thousand tablets that have been uncovered since the first dig in 1928. Scholars have translated half to two thirds of the tablets, and about a quarter to a half of the translated texts are readily available for public consumption. The clay tablets themselves are over 3,200 years old and have gotten broken or scarred through time, or sometimes a scribe starts a tale on one tablet then continues on another tablet which is now missing or too broken to read. One frustrating gap lies in the Epic of Aqhat, a tale of a young man who comes of age. The craftsman god Kothar-wa-Khasis gives Aqhat an incredible bow for hunting. ‘Anatu, the young warrior goddess, sees the magnificent bow and wants it for herself. She sends a henchman to kill Aqhat and steal his bow. The plan partly succeeds: Aqhat dies, but the bow gets broken. Aqhat’s sister, Pujatu (also called Pughat, or Puģat) asks her father for his blessing as she seeks vengeance for her brother’s death. She puts on the clothes of a warrior, then disguises herself and her warriors’ clothing in women’s clothing. She infiltrates the henchman’s camp. The henchman invites her to sit with him and he brags foully about how he killed Aqhat. This fuels Pujatu’s rage even further. She pours the henchman a drink and … . The text breaks off. I find the gap as frustrating as watching the cliffhanger of a dramatic series which gets cancelled before the next season. EHS: Have you ever drawn upon neighboring or succeeding cultures to fill in some of those gaps? If so, can you offer an example? TD: Archaeologists have found a decent amount of iconography in Canaan, but the Canaanites tended not to label or sometimes didn’t leave clear visual indicators as to who the images depict. Of the many Canaanite images which depict young women, it’s difficult to know which represents ‘Anatu or ‘Athtartu. Sometimes we compare images with Egyptian iconography thought to depict ‘Anatu — a young, small-breasted, weapon-bearing goddess. In light of Egyptian iconography, it is likely that most of the Canaanite imagery of a goddess in smiting pose, holding weapons, or both, represents ‘Anatu. Also, archaeologists have yet to uncover any cosmogonical tale in Ugaritic and Bronze Age Canaanite lore, although there are tales which demonstrate a cosmological structure. If we want a cosmogonical story, a tale of how the universe came into creation, we must borrow from Phoenician tales of Classical times as written by Philo of Byblos, or consider carefully the creation tale of the Bible and try to think of it in a polytheistic revisionist style. I find the tales recounted by Philo of Byblos preferable. EHS: You have made a point of studying Ugaritic. How fluent are you at this point? And how has your knowledge of the language influenced your practice? TD: I think it is nearly impossible to be truly fluent in any dead language. A person can become proficient in a dead language. For fluency, though, the language must have regular use in conversation instead of remaining stagnant, dead, and obscure. I would like few things more than to hear Ugaritic live again, but that is a distant goal. I am still yet an amateur working towards proficiency. I don’t dream in Ugaritic — yet. I can translate simple texts with the use of a few glossaries and grammar books, and it helps me greatly when I can compare multiple translations. I can translate from English to Ugaritic and some Ugaritic to English, but it is a process that can take me a while. What has enlightened me in my Ugaritic language studies is the very physical, biological nature of the language, and how these biological nuances sometimes do not translate well. Typical Ugaritic words have a three-letter root, and through knowing the three letter roots, you can know how the Ugaritans conceptually organized their world. For instance, the root for the word “to bless” is the same root as for the word “knee,” which demonstrates the interrelatedness of bowing in honor of the deities and of gaining their blessing. In another instance, the word for soul, napshu, is the same word which means throat, appetite, and vitality. An ailing person is said to lose napshu or suffer in the napshu; an opening of the throat shows a regaining of the appetite, and both an opening of the throat and the regaining of an appetite describe a soul’s return. A person recognized for her goodness is described as having her head raised. If the head is lowered, it demonstrates shame. If someone makes another person’s head heavy, it means that the person is honoring someone: it is as if a crown of honor weighs upon the head. The language is full of body metaphor. EHS: In your years of researching and practicing Natib Qadish, what is one curious tidbit that you came across and would like to share? TD: All of it fascinates me — from the literature, to the magical incantations, to the herbal cures for ailing horses. In one text, the god gets drunk at a marzichu — a drinking and feasting rite. The goddesses ‘Anatu and ‘Athtartu return from a hunting expedition only to go out again in search of a cure for Ilu. They find the right plant and crush it up in an olive oil preparation and add the hair of a dog — yes, a hair of a dog in a hangover cure — which they apply to Ilu’s forehead. I also have interest in the mixtures used as herbal cures for horses. Some of the mixtures include walnut, flaxseed, lettuce, fennel, raisins, flour, cassia, juniper, coriander, or fig cakes. An ancient veterinarian would use different ingredients for different ailments, pulverize the ingredients, add them to liquid, then pour the mixture into the horses’ noses like a primitive inhaler. I certainly don’t suggest doing that today, but the fascinating texts give us a glimpse into ancient medicine and the herbs available. EHS: What do you think of the movement in some Pagan communities to establish professional priesthoods? And, do you foresee such a thing for Natib Qadish? TD: Ooh, Rebecca, you had to open that can of worms. These two questions are quite separate because Natib Qadish does not qualify as “Pagan” by most of the modern definitions of the Pagan movement that I know. Indeed, I do not classify myself as “Pagan” either, so take what I have to say next about “Pagan priesthood” with a pillar of salt, for these are my observations as an outsider. I have observed that the general Pagan community finds the subject of priesthood controversial because many people come to Paganism with a bad experience leftover from their former religion. Some folks have a great deal of discomfort with the idea of “organized” religion, and an “organized” priesthood with a hierarchy. Organization is not the enemy. Structure is not the enemy. Hierarchy itself isn’t always a bad thing. What is bad is when a person in authority misuses the authority. In such cases, authority should be taken away. I’ve seen organization and hierarchy creep into what had been thought of as an “unorganized” group, and I’ve seen the leadership abuse the roles. So let’s not kid ourselves and pretend that such abuses of hierarchy can’t or don’t happen even in “dis-organized” religions. Indeed, sometimes it’s easier to take advantage of the chaos for ill-intent. I think that people who are apprehensive of organized religion sometimes forget that there are two components in religious practice: formal religion and informal/folk religion. It never has to be one or the other — in fact in the case of most “organized” religions, you’ll find both. For instance, a Jew who attends synagogue will lead her own family Shabbat dinner prayers. A person who goes to Catholic church services sometimes makes use of curandero practices. What a Wiccan does in an Alexandrian circle will differ from his kitchen magic. Just because a person participates in an “organized”, structured religion doesn’t prevent, preclude, or prohibit her religious practices in an informal setting. And it surely doesn’t mean that a person needs to check brains and free will at the door. Paganism as a movement faces an identity crisis from rejection to organization. This rejection causes a decentralization of resources, ideas, and leadership to the point of disempowerment. Eventually it would benefit the Pagan community to come to a consensus — which is difficult considering the lack of organization — over whether Paganism will consider itself one vague generalized philosophy (singular), or a confederation of different religions (plural). Some definitions and descriptions of “Paganism” which try to unify under a vague generalized philosophy accidently exclude other religions that Pagans would like to include, because the definers often lack understanding of the other religions. Alternatively, definitions and descriptors become so broad and inclusive that it is impossible to separate the Pagan movement from those who are non-Pagans: the word’s meaning gets watered down and becomes useless. In expanding the definition to embrace everything, it means nothing. Seldom do you see diverse, separate, non-related religions come together under one category. I don’t foresee a confederation of separate religions coming together well under the banner of “Paganism.” By comparison, the heading of “Christian” includes people of the same general religion despite denominations. The word “Christian” embodies commonalities accepted by insiders and understood by outsiders: a shared literature, the same deity and messiah, some holidays, and a very basic philosophy — Paganism as a movement isn’t this defined yet. Pagans can’t play on the same team and meet common goals if they can’t agree on what sport they’re playing and who is on the team, or if they all play by their own rules. And none of the spectators will understand what’s going on either. Without a clear, common understanding of what the term “Paganism” means, it is difficult for Pagans to coalesce into one community, and more difficult still to grasp the movement’s foundation. If the Pagans don’t have a very clear idea of what their movement is about, it leaves non-Pagans completely clueless. You can’t educate and clear up misconceptions about Paganism to non-Pagans, when there isn’t a clear and common understanding of what Paganism is. I feel as an outsider that it must be exceedingly difficult for Pagans to constructively discuss whether or not the Pagan community/Pagan communities can or should establish priesthoods in light of such a basic identity problem. In this confusion, anyone can snag a title of priesthood for himself citing that he believes himself to be his own priest. If a person is his own priest, then only he himself has the right to call himself by his title. A priest not accepted by the community does not represent the shared deities of the community or the community itself, and the community is under no obligation to call him by his chosen title. And a community that can’t define itself has a difficult time defining and organizing a priesthood: would a priest of Paganism practice and understand all of the religion(s) thought to be included under the banner of “Paganism”, or specialize in a denomination or tradition? Or, do all under the banner of Paganism accept eclectic Wiccan-esq circle rites and the Wheel of the Year as a symbolic and theological lingua franca even if there are non-Wiccans there? And what are the recognized standards for becoming a priest? Without a clear understanding of the religious movement itself, the question of priesthood /priesthoods is without enough foundation for constructive discussion. See, in this matter, I don’t even know if I should make terms singular or plural — the Pagan community or Pagan communities; a priesthood or priesthoods; denominations or traditions of the same movement, or separate religions? The profusion of self-identified Pagans who call themselves “priest” or “priestess” has cheapened the titles to the point that often neither insiders of the Pagan community nor outsiders takes a Pagan “priest” or “priestess” seriously at first glance. The title carries no weight, no meaning, and each priestess ends up having to prove that she is a priestess instead of proving herself to become a priestess. Outside of Paganism there are separate religions that seek to revive ancient polytheistic ways. These religions are not different denominations, traditions, or sects of Paganism; they are separate religions in their own right. Even in Voices from the Pagan Census by Berger, Leach, and Shaffer, “Paganism” is addressed as one religion with separate sects; six of the main sects include Wiccans, Druids, Shamans, Unitarian Universalists, Goddess Worshippers, and a catch-all “Pagan” category. Natib Qadish is not a part of the one religion that Paganism questionably is, and Natib Qadish certainly doesn’t fit under any of the six sects of the “one” religion. A revivalist religion often has as little in common with the problematic the problematic category or religion of Paganism as Christianity does with Hinduism. Revivalist religions often have fewer reservations about organization and less of an identity crisis than Paganism. For instance, the people of Religio Romana share a common goal of honoring the Roman deities and revitalizing ancient Roman religious ways. Likewise, Hellenics typically share a common adoration of the Greek deities, Greek polytheistic religion and philosophy. In ancient days, Greek and Roman cultures established priesthoods. It makes sense that their revivalists would do so again in modern times. Typically in these polytheistic religions, a self-proclaimed title grabber doesn’t maintain a title for long because a title requires recognition from the deities, community acknowledgment in the divine recognition, and community acknowledgement that the person is a leader. Natib Qadish follows in the same vein. The ancient Canaanites had different types of priests who specialized in roles including scribal duties, offerings, cleansings, or divination. Their titles often reflected the priests’ specialties. We don’t yet have the numbers to support that level of complexity, but that doesn’t mean we can’t have priests in a general sense today. It is good to have someone who specializes in the religion, the deities, and the rites to aid the community; someone who has the deities’ blessing and who has accrued knowledge and experience. If you wonder whether myrrh or lotus incense would be better for a particular deity, it’s nice to have a priest you can ask. If you’ve had a powerful dream, it helps to have someone you can consult. In prayer, having a priest aid you is a lot like getting a signal boost. In ancient times, priests would serve the deities continuously in the temples: these acts ensured the deities’ wellbeing and the deities’ continued support of the community. In having a priest around today who is dedicated to honoring the deities and acting on behalf of the community, you know that the deities are continually honored well, even if you can’t. Someone is constantly keeping watch over the deities’ temple and feeding them, honoring them, praying on behalf of you and the community, just as it was done in the old days: this is what I do today, and gods willing someone will be there to continue the tradition. There are few people with the leadership skills, the diplomacy, the time, the patience, and the relationships with the deities to do what priests do. It’s like any profession: do you try to do your own electrical work and plumbing, or do you hire a professional so you don’t electrocute yourself or end up with sewage problems? And you recompense them for their skills, their education, their time, their preparation, their expenses, and their labor, for there’s a lot that they do that you’ll never see. The ancient Ugaritans did the same: paid their priests so that they could continue the good work. 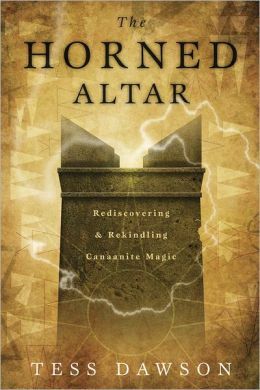 EHS: How did you design the divination spreads in The Horned Altar? Do these spreads work with tarot and other tools, or do you recommend they only be used with Canaanite tools and symbols? TD: The spreads in The Horned Altar are based on Canaanite, Semitic, and Middle Eastern motifs, themes, and symbolism that occur in art, iconography, and literature. We who practice Canaanite religion have a wealth of symbolism to draw on and we have our own divination tools which work well within our own symbolic language. If, for instance, you were to use playing cards, you’d want to keep in mind that the hearts don’t symbolize love in Canaanite culture — a heart symbolizes the mind. If you were to use tarot, the symbolism can get wonky again: cups mean blessing in Canaanite thought — not “emotions” and certainly not the “element of water” since that system of four elements is absent in Canaanite culture and religion. When someone comes to me for a reading, I use divination systems that pertain to Canaanite culture and symbolism: I would not use tarot or Norse runes. After all, you don’t go to a babalawo for a tarot reading or a look at your Western astrology chart; no, you’d go to him for an ifá reading. If an individual is more comfortable as a beginner in using the spreads with tarot or runes as part of an informal practice, it is certainly doable. Canaanite tools with Canaanite symbolism will still yield better results. Anything after that is watered down, beings to lose its potency, and sometimes it gets downright awkward. The nuance changes and you can lose information by using cultural oracles interchangeably (i.e. a Near Easter Canaanite system with a Western European divination tool). It’s like using Norse runes without knowing Norse culture: you can memorize pat answers from a pamphlet or you can become truly proficient by having a deeper understanding of what each Norse rune truly means in a broader cultural context. Anyone can parrot back an answer, but it takes cultural understanding and depth to go further and I think the deities of the culture are better able and more comfortable communicating in an oracle compatible with their cultural metaphors. Long story short: if it’s necessary, use the spreads with the tools you have and the tools you know, but remember that this is a crutch and you can learn so much more if you put in the effort to learn about Canaanite divination tools. And for best results, use a Canaanite-based divination tool with a Canaanite-style spread. EHS: Witch is a term that has been reclaimed within certain circles of Paganism. Is the term appropriate for Canaanite magic-users? If not, what term/s are better? TD: What happens in Paganism with regards to the term “witch” doesn’t have bearing in Canaanite magic. The term “witch” in English has implied a worker of bad magic for a very long time despite some groups’ recent efforts to claim or reclaim the word. In addition, the word is born of Indo-European languages, instead of Afro-Asiatic languages, which makes the term even less useful for a practitioner of Canaanite magic. (Canaanite languages are Afro-Asiatic, not Indo-European.) Even if you look at the term “witch” in other modern settings with those who would reclaim the term, it is still inappropriate for charshu, Canaanite magic, because the term generally finds use in systems, paradigms, philosophies, and religions that have nothing to do with a Canaanite context. It would be like using boating terminology for a forest hike. When Near Eastern and Canaanite scholars translate titles of evil magic doers from Ugaritic into English, they often use the word “witch,” but they avoid using the word “witch” in situations referring to beneficial magic doers. There are no words in Ugaritic applied to both evil magic doers and the makers of ethical magic: each genre has its own vocabulary. Thus, using a term in English which could describe either type of magic but has traditionally implied “evil” would be culturally inappropriate. In English, more accurate terms would involve: mage, theurgist, charmer, enchanter, scribe, technician, maker, or magician. When in doubt, Ugaritic comes to the rescue. You can use the word “charash” in the absolute form, or you can use it with the appropriate masculine/feminine nominal endings: charashu or charashatu, respectively. The word means “builder,” “maker,” and “craftsperson;” and it is the exact term they used for a maker of beneficial magic. EHS: How does Canaanite magic differ from other magical systems, like the Greek Magical Papyri? TD: Charshu, Canaanite magic, works with ancient Canaanite symbolic language, worldview, and understandings. Beyond this, it functions on a level of learning to work with one’s own soul and of developing relationships with the deities so that they may also contribute their souls to your magical undertakings. A charash doesn’t view “energy” as a resource there for the taking. Instead, a charash works with napshu, the soul — one’s own soul, and sometimes the soul of a deity. Souls are something to treat very carefully, and with great respect. In the PGM, a magician often cajoles or commands a deity to do a task. In charshu, a mage doesn’t take this approach. This doesn’t appear in the ancient magical texts of the Bronze Age, and if it happens to turn up it is likely amateur magic. If it was ever done this way, it would have been done outside the realm of official magic, and likely outside the realm of ethical magic, too. In using Canaanite magic, a charash has some measure of dedication to the Canaanite deities, culture, or both, and a charash leans towards using methods, motifs, and themes standard to Canaanite ancient culture where possible. This means that if given a choice, the charash will put down the New Age or American Indian sage bundle and pick up the myrrh incense for cleansing. A charash will prefer Canaanite numerology or Phoenician letters over runes or tarot cards. A charash will view the physical body from a Canaanite perspective instead of the Indian chakra system. In Canaanite thought, the head represents honor, throat is soul, heart is mind, liver is emotion, hand is strength, knees are blessing, and so on. See how different that is? Much of what surrounds us as “magic” in Western culture today is Western European based, or is brought to us eclectically from other cultures and divorced of their deeper cultural contexts. I think of it in the context of a restaurant. You’re never going to get excellent shawarma from a place that cooks Chinese, Mexican, American, and Lebanese cuisine. You’re going to miss out on a depth and nuance of flavor. Just as in magic: jack of all trades is master at none. EHS: What is an example of an ethical use of magic? TD: Ethical magic is magic done with concern for the overall good of a larger community or locale, or for the greater good. This can, however, include defensive and offensive magic if necessary. Community wellbeing is important but the idea of a “law of three” as often seen in Western European-based systems or “karma” such as it is explored in New Age common thought (not in its original Indian context) are absent. Examples of ethical magic include healing, protection, prosperity, cleansing, and expulsion of evil, so long as these are done with respect to the common good. Healing a family member or a respected leader is ethical. Healing a convicted killer who, if released would only kill again, isn’t ethical. Being a good person, doing good deeds, and aiding your community increases both your self-respect and the respect with which others view you; this, in turn, increases your napshu. A stronger napshu increases the potency of your magic. EHS: Are there any magical acts which are considered inappropriate in the Canaanite system? If so, what are the consequences? TD: An act of magic done to achieve otherwise illegal acts is like doing the illegal act: wrong. For example, in ancient times as in modern times, it is illegal to harm someone’s livestock. If you do magic which causes someone’s livestock to die, that too in ancient times would be illegal — and by default also unethical. (Since many of us don’t live around farms or livestock, I’ll bring the metaphor a little bit closer. Getting annoyed at the little yappy dog next door and making him ill solely through the use of magic so you don’t have to hear him bark any more is unethical. It would be as unlawful in ancient tradition to make him ill through magic as it would be to poison him. And it’s just plain mean.) Acts of magic intended to elevate your circumstances by harming or causing detriment to someone else is unethical. Acts which harm your community are unethical; acts which harm the greater good are unethical. There isn’t exactly a cosmic Canaanite police force that will throw you in jail, no caped Canaanite Superfriends will knock down your door. But if you engage in unethical magic, you weaken your magic and your soul. It causes the Canaanite deities to avoid working with you, so you’re stuck relying just your own napshu and your own charisma in the community, which will both be weakened. And you definitely risk the censure of other charashuma (Canaanite mages). In old days, you’d be kicked out of the city and left to fend in the desert on your own. EHS: How integral was magic to ancient Canaanite spirituality? What about for modern practitioners? TD: Canaanite magic is used in both ancient and modern Canaanite religion, but it is not integral. Plenty of people in ancient days didn’t know anything about magic, and would consult with a priest or a freelance mage if they believed a need for magic had arisen. You can practice Natib Qadish or any Canaanite polytheistic religion without ever doing any magic. However, the priests of old often performed magical acts for the good of the community, protection of the city, and for the wellbeing of the ruling dynasty. It was one more way to try to preserve humanity against tragedy. Most of the magical texts I’ve seen involve divination; the healing of a child; the cleansing of illness; and the negation of evil spirits, the ‘enu (evil eye), bad magic, and bad magic doers. As far as the modern day, you can use magic every day if you believe it is right and for the greater good; you can avoid using magic altogether; or you can seek the counsel of a charash who is more qualified and hire her or him. EHS: What resources would you recommend to those interested in Canaanite magic? TD: I would suggest The Horned Altar: Rediscovering and Rekindling Canaanite Magic, Ugaritic Narrative Poetry edited by Simon B. Parker, Pardee’s Ritual and Cult at Ugarit, A Primer on Ugaritic by Schniedewind and Hunt, Budin’s The Myth of Sacred Prostitution in Antiquity, The Goddess Anat in Ugaritic Myth by Neal Walls, and Handy’s Among the Host of Heaven, for starters. TD: I’m currently working on two blogs, one at Tess Dawson and the other at Baal’s Cedar. I’m tinkering with an herbal book that explores Canaanite and Middle Eastern symbolism of herbs, and I’m polishing a science fiction tale. EHS: Which book fairs, conventions, or other events will you be attending in the foreseeable future?